Don Dernovich attended the University of Wyoming and Fort Hays State University, Kansas, earning the B.A., M.A. and M.F.A. degrees. He has participated in many invitational, group and national juried exhibitions including the Oil Painters of America, National Watercolor Society, National Academy of Design, The American Watercolor Society, C.M. Russell Auction, University of Wyoming Art Museum, MONA Spirit of the Great Plains Invitational, The Phippen Western Art Show, and the annual Arts For The Parks Exhibition. His award winning work has been featured in books Splash 4 and Splash 5 and Painting Light and Shadow by Northlight Books, the Best of Watercolor books: Painting Places and Painting Color by Rockport Publishers, and the American Artist magazine etc. 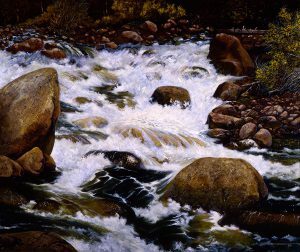 Dernovich is a Signature Member of the National Watercolor Society and is listed in Who’s Who In American Art and Who’s Who In America. He and his wife Kathy live in Culbertson, NE.